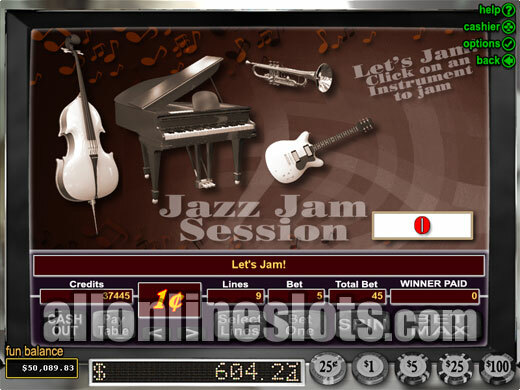 Jazz Time is a music theme slot from RTG. It is an older style 5 reel, 9 line game with a 45 coin max bet. 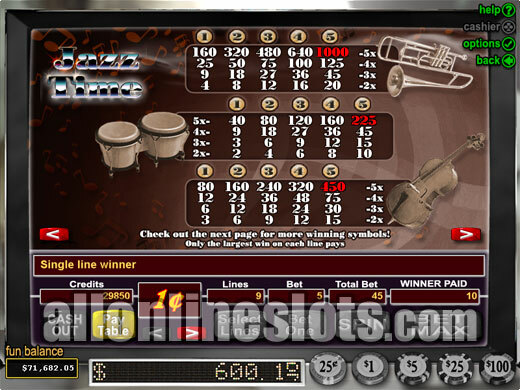 Top jackpot on teh reels is a nice 10,000 coins (50,000 at max bet) and the game has two pick a box bonus games. 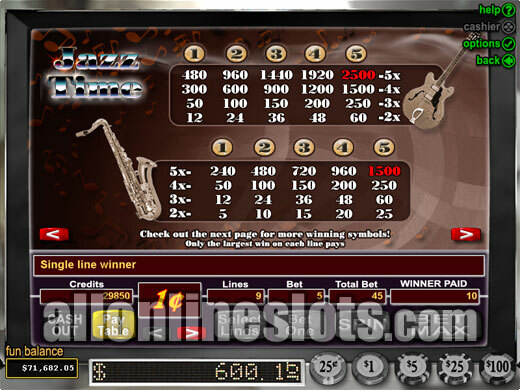 Jazz Time is a Realtime Gaming video slot with 5 reels and 9 lines. As you would guess the game has a jazz music theme with both symbols and sounds giving a good jazz feel. The game also has two extra bonuses including a pick a box bonus where you get to jam. 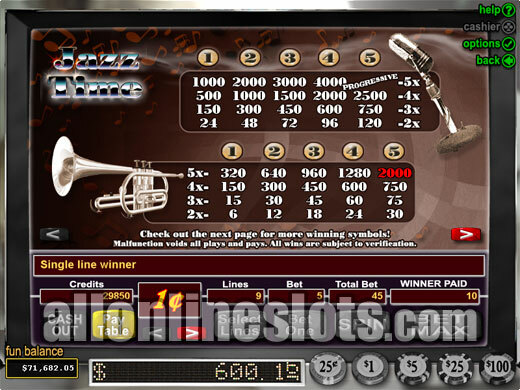 The game has a maximum bet of 45 coins or 5 coins per pay line. You can choose to play in one of six coin sizes (1c, 5c, 25c, 50c, $1 and $5). In a bit of a twist this game can have a progressive or fixed jackpot. This is on a casino by casino basis. For example iNetBet has a progressive for the 1c, 5c, 25c and 50c coin sizes and a fixed 10,000 coin jackpot for the $1 and $5 games. If you decide to play a progressive version it is very important that you play the full 45 coins per spin as you cannot win the progressive if you do not. Even the non progressive version requires that you play max bet to win the 10,000 prize so max bet is generally a good idea on Jazz Time. To win the major jackpot you need to line up five microphones on any active pay line. Getting four microphones pays a nice consolation prize of 2,500 coins. You can also win 2,500 coins with the five guitars. The five trumpet symbols make up the next highest pay with 2,000 coins for five of a kind. The BIg Money Scatter bonus is a reel based bonus. To win the feature you need top get a high hat, snare drum and drum stick symbol anywhere on reels 2, 3 and 4. The three symbols then come together and award up to 350 credits. The second bonus is the Jazz Jam Session. This is won by getting three scattered pianos on reels 1, 3 and 5. Once activated you move on to a second screen where you have four instruments (View Screenshot). You get to pick one instrument at a time to start jamming. Once all instruments are playing you are awarded a bonus prize of up to 4,000 coins. 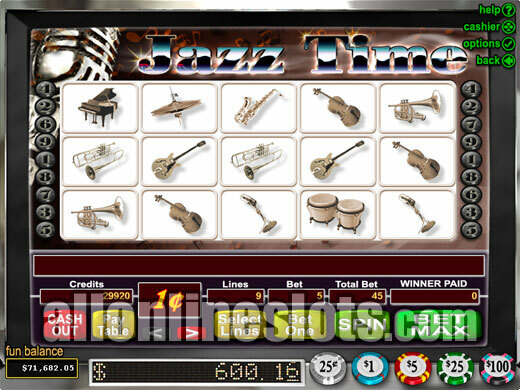 Jazz Time makes good use of the jazz theme with both the sounds and graphics. Just remember that you have to play maximum bet to get the most out of the game.